Today I promised to show some pics of the first of two Bonus Packs I have compiled for Foto/Fiber 2012. 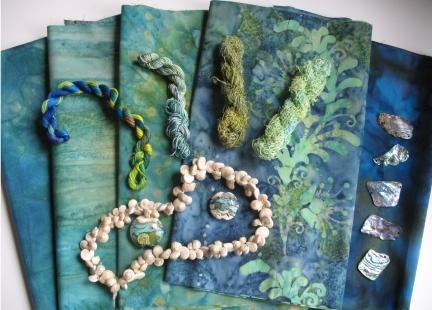 I have named it " Ocean View" and I could see some talented soul using this pack to create a lovely ocean scene with just a few additions from their stash. 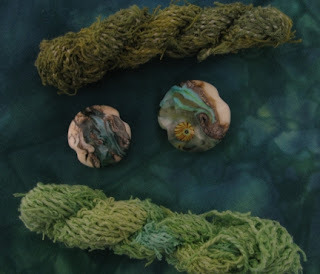 Two of the threads I am offering are hand dyed and very textured, putting me in mind of sea weed. The two pieces of sea themed lampwork are donated from my personal collection and have been created by artist Jeanie Munro of Scotland. They are quality pieces and have lots of potential for adding color and dimension to an ocean themed art quilt or any other creation of your choosing. Drop by tomorrow when I kick off the first post for Philosophy Friday! Check in with me over the weekend too as I will be featuring my second beautiful Bonus Pack entitled " Raz Ma Taz " for Foto/Fiber 2012 in detail. PHILOSOPHY FRIDAY - Respect ! Kicking off the blog with a Bang!